Whenever I would tell people that I hadn't been to London I would get an incredulous look. It was a look that said, "You've been to South Africa, lived in Paris and are going to China – how have you not been to London." To be honest, I had no answer for this question that made sense. So when our board meeting was scheduled to take place in Belgium in June, I decided the only thing that made sense would be to indeed take a week and go to London after the trip. I was also excited that the trip was going to coincide with London Pride – an event I learned all about from my friends who worked on the event that I had met at the InterPride convention. Leaving on a Monday from Antwerp, I figured the easiest way to get there would be the EuroStar. The actual cheapest way is on a flight from the Antwerp airport which was about $70.00 if booked well in advance, but I unfortunately waited until the last minute. So EuroStart it was, via Brussels. The train was nice, anything you would normally expect from a European rail experience. Flying past cute Belgian and French countryside, through a dark tunnel and then the British countryside. I arrived at St. Pancreas station and thus arrived in the UK for the first time in my life. I can't really describe the first feelings of walking around London and experiencing the Underground. It was almost surreal, visiting a place that you've spent your entire life learning about and seeing on screen and elsewhere and then being there. 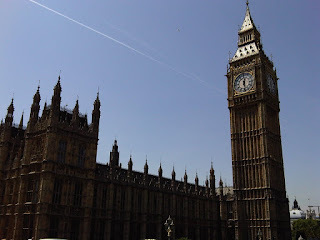 I suppose since the US has such a cultural connection to the UK it makes sense – but I found myself feeling almost giddy hearing, "Mind the Gap" and being on the "Piccadilly Line." I was lucky enough to stay at the Radisson Edwardian Hampshire Hotel on Leicester Square – in the heart of West End – an amazing location. I lugged my luggage up the stairs of the Leicester Square station and as I walked through the square looking for the hotel, the vibe of the city almost overwhelmed me in a great way. There was a movie premiere for Johnny Depp's new movie so there were people everywhere hoping to get a glimpse of the star. I hadn't been this close to a movie premiere, even with all the time I've spent in LA. People were lying out in the square, eating in restaurants, laughing, having a great time. It was a Monday, but it could've been any weekend day with the amount of activity and I all of a sudden longed to be a part of it in any capacity. I had an agenda that first night – so I had to check into the hotel and head over to an IGLTA Reception. My favorite part about being in a new city is walking around and just taking it all in, so I quickly Googled where the place was and found an easy walking path there. I saw that the walk would take me around Buckingham Palace, and felt that giddy feeling again. I must also mention that London was experiencing a bit of a heat wave with temperatures in the upper 30s degrees Celsius. The walk was great if not a little warm – the lush green parks surrounding the palace also full of people lounging and laughing. The urge inside of me to be with them, to sit in the area with my friends and make new friends was overwhelming again. I arrived at the reception a little sweaty – it was held at a great hotel bar in the Red Carnation Hotel right to the west of the Palace. A few drinks of wine and some hors d'oeuvres, I was able to reconnect with some IGLTA members I had not seen since our convention two months prior in Toronto. I also had the luxury of making new friends and thus a plan for my first night in London. They were going out to a couple bars in Soho, in the gay neighborhood, and invited me along. We hit up Old Compton Street – a street that I would get to know well as the week progressed and Pride overtook the area. If there's one thing people can say about the British (at least the ones I experienced in London) it's that they know how to have a good time. Here it is on a Monday night and not only were the bars packed with people streaming onto the street, but there was no shortage of alcohol and an excitement for the night and week ahead. I don't know about you – but this is what Monday should be. Not a day to be dreaded, but a night to celebrate the week ahead. I then came to learn that this seemed to be the mentality of Londoners, Monday let's celebrate the week ahead, Tuesday to celebrate the great day you had or to lament the bad day, Wednesday cause the week was almost over, Thursday to pre-game for the weekend, Friday to celebrate the weeks victories, etc. While some people may scoff at the seemingly over-indulgence of beer at pubs, I welcomed it as a celebration of life. Laughter and beer should be enjoyed whenever possible in my opinion. The night wasn't too late as the next day I wanted to get some work done and get in some touristy sight-seeing. I was close enough to walk back to my hotel and as I approached Leicester Square, again felt excited to be in the heart of such a vibrant community. The overwhelming happiness and life that flowed from almost every corner was incredible. Waking up bright-eyed and bushy-tailed on Tuesday morning I decided to hammer out some walking (as it's my favorite thing to do in a new city) and just see what I could. I didn't want to necessarily do uber-touristy things because my friends Tommy and Trenard were joining me that week for Pride so I was saving some for them. My excursions took me from Trafalgar Square to the Thames, by the London Eye and then some dramatic exploration of the theater district. Losing myself in the streets of Soho and nearby communities gave me a great picture of the area and I felt like I knew where I was. My first 24 hours in London set the stage for the rest of the week. I knew that no matter what happened that I would find myself in the middle of a vibrant, alive city and that was exciting enough. Added to the fact that I've wanted to be in London for years and heard so many great things fueled my excitement and I couldn't wait for the rest of the week to take me on journeys I couldn't even fathom. Excellent post Richard! My partner and I are leaving for a week's vacation in London starting this coming Tuesday! We, too, have never been there and are already "giddy" with excitement.